No need to slip and slide north to Vermont. And, forget about scrambling for a passport to cross the border to our northern neighbor. In the next several weeks, a number of local maple festivals make it possible to observe firsthand the fine art of tree tapping as taught to European settlers by Native Americans centuries ago, and to see and smell the centuries-old process of boiling down the sticky liquid in kettles over open flames. And, of course, there will be plenty of chances to sample maple syrup, maple candy, and maple doughnuts with fellow devotees. Not surprisingly, each maple festival has its own distinct flavor. Many have long traditions of celebrating and have grown to expand their offerings over the years. Others have retained a back-to-nature feel. All offer a chance to indulge gastronomically in naturally fat-free maple syrup. 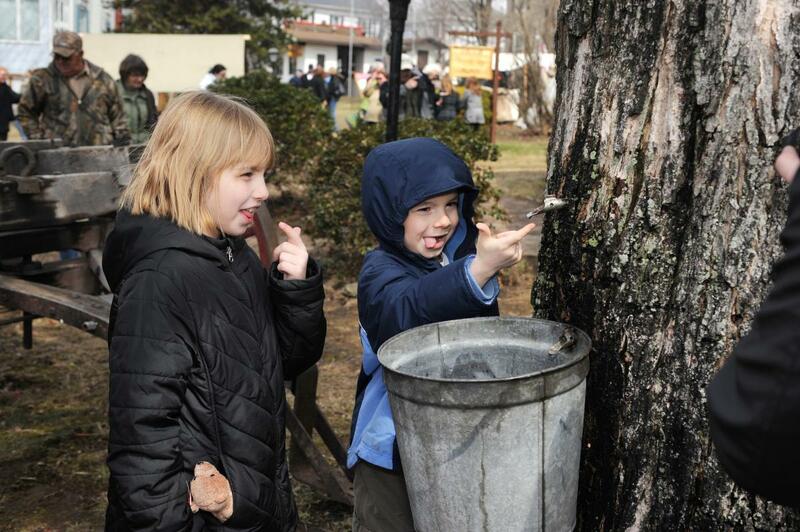 Meyersdale, nestled in the Laurel Highlands, goes all out with the 71st annual Pennsylvania Maple Festival, slated for March 17–18 and 21–25. A highlight of the festival is the presentation of The Legend of the Magic Water. Noted for its pageantry and cast of 100 members from the community, the historical drama traces the discovery of maple syrup. At Festival Park, history lovers can step back in time at the Historic Meyers Homestead, the doctor’s office, the cobbler shop, the country store, and a sugar camp. Demonstrations include tapping the trees, boiling the sap, making sugar cakes, and twirling “spotza,” a clear taffy formed after the syrup is boiled down to the soft-ball stage and then poured over crushed ice. Displays include antique cars and farm machinery, arts and crafts, and quilts. The festival also features a parade and crowning of the Maple Queen. Many of the predicted 10,000 to 15,000 visitors will head to the Lions Club Pancake House for a scrumptious stack topped with maple syrup.